The Replace function to replace text or char about Keyboard Shortcuts with special character support in QuickTextPaste from Version 3.61, for all Windows OS! The QuicK Text Paste will replace the Strings (chars) and send the text back to the foreground Program via paste command. is essentially similar to: ... what can I do with %copy_text_uc% and %copy_text_lc%? 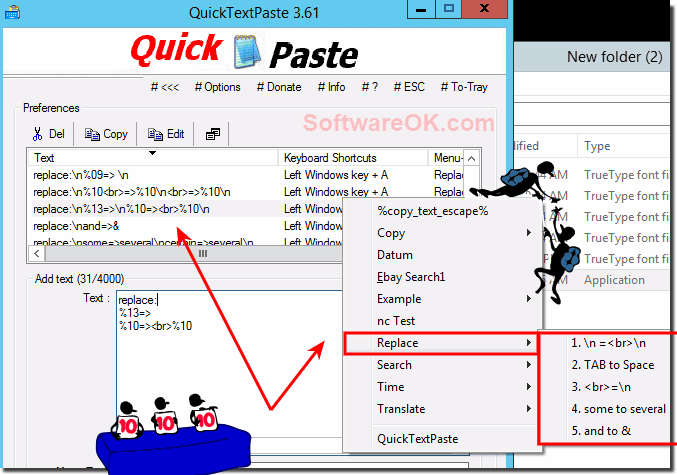 Please use the the command replace: in the famous QuickTextPaste Freeware! Please use always ... the latest version of QuickTextPaste for Windows! (Image-1) Create sub-menus for multiple replace commands! 1.) ... Replace line breaks \n with html <br> line break! 2.) ... Replacing the & character with html &​amp; often used in HTML! 3.) ... Replace of string total by amount! 1.) Replace line breaks \n with html <br> line break! 2.) Replacing the & character with html &​amp; often used in HTML! (Image-2) Replace special character support! 3.) Replace of string total by amount! QuickTextPaste - FAQ-23: Replace function with special character support!